I know, that was a pretty corny thing back there, but I did read in New Scientist not so long ago, that micro-dosing is all the thing in Silicon Valley today. No, new tech in itself doesn’t cause job losses. Rentier statists (such as Peter Thiel) that own and control most of the new tech do. Automation and artificial intelligence may not cause the mass unemployment that is often predicted, according to new research shared with RNZ Insight. The study by the AI Forum says many workers will lose their jobs due to technological change, but it suggests new types of employment and government support, mean most people should be able to adapt. But it does warn some individuals could struggle. For the full story, tune in to RNZ Insight on Sunday after 8am. I’ve been thinking about New York Central Park. The designers wanted to reserve that public space so that everyone could meet on an even playing field. It was an egalitarian theory that worked out pretty well. It’s to mitigate some of the stress humans can experience when living in such a massive constructed environment. City’s are technology. The big national parks where designed by the same people, the Olmsteds. Again, the big vistas are reserved so we all get an equal chance of keeping our feet on the ground, metaphorically speaking. More and more automation is being introduced to our living environments. Facebook is an automation, as is Twitter. Even the book is an automatated narrative. So we look for things to keep us grounded. Garden supply shops know about that, then that gets automation to maximise profits. RNZ Insight: Is NZ Ready for Artificial Intelligence? Ann Pettifor, one of the few who correctly predicted the Great Recession, further reinforces what I wrote to begin with. 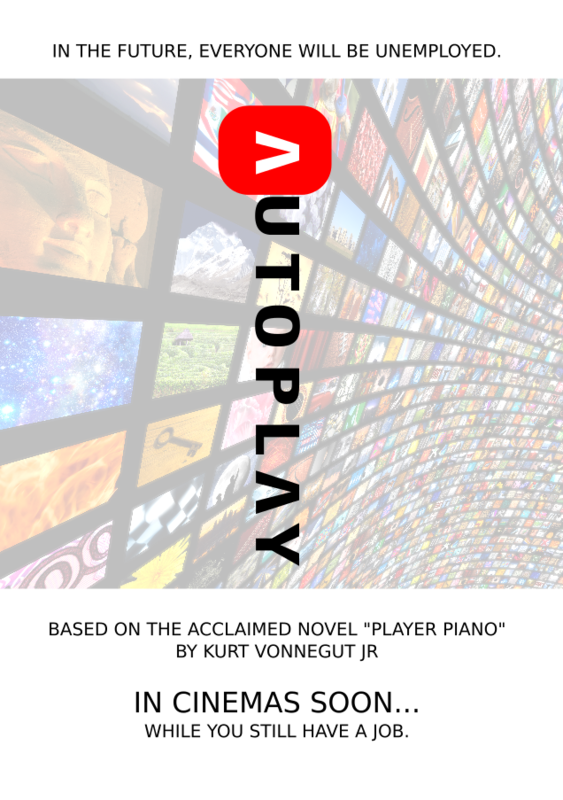 Fun fact: Kurt Vonnegut wrote about these topics in the novel "Player Piano" in 1952. Yes, the same year Helsinki held the Summer Olympics. 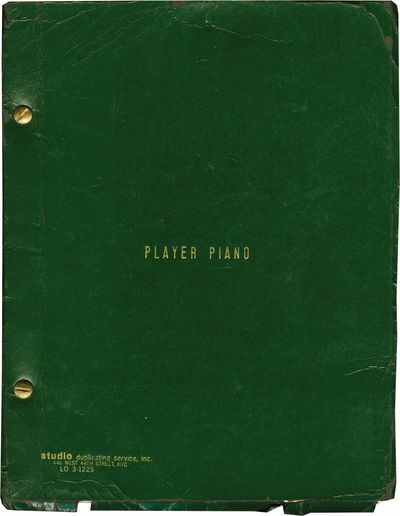 It's long overdue for a movie adaptation, although player pianos are a bit obsolete these days. They've been replaced with autoplay streaming media, so when someone does get round to making the movie, here's what the promo poster might look like. Robotisation has reduced the number of working hours needed to make things; but at the same time as workers have been laid off from production lines, new jobs have been created elsewhere, many of them more creative and less dirty. So far, fears of mass layoffs as the machines take over have proven almost as unfounded as those that have always accompanied other great technological leaps forward. There is an important caveat to this reassuring picture, however. The relatively low-skilled factory workers who have been displaced by robots are rarely the same people who land up as app developers or analysts, and technological progress is already being blamed for exacerbating inequality, a trend Bank of America Merrill Lynch believes may continue in future.